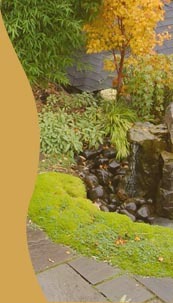 About Elliott Bay Landscape Design Inc.
My name is Todd Benevedes and I created Elliott Bay Landscape Design in 2003. I came to this work through a passion for the outdoors. As a college student, I had the opportunity to travel to Europe and see the Matterhorn, where I became driven to learn to climb and mountaineer. In the years that followed, I lived and climbed extensively in Yosemite, had an excellent adventure in the Himalaya, and have taken countless trips in the Cascades and Olympics here in Washington. Although there is nothing to replace the experience of being in the wilderness, I still derive great joy from spending time in the landscape right outside my doorstep. By creating enjoyable outdoor environments at our homes, we can reconnect with nature every day, and share that love with our families, friends, and neighbors. As a business owner, I truly love working together with clients and our crew to create fabulous outdoor spaces. Emily Benevedes, my wife and co-owner, has played a key role in our business pursuits from the beginning. From doing the book keeping and payroll, to helping make important hiring decisions, and now in her growing role as a landscape designer, she is becoming more and more involved with the mission of our work. She loves the convergence of creativity, science and geometry that landscape design is all about. With a keen eye to how landscape construction works, she also has a solid foundation of designing spaces that make sense and flow well. As a lifelong naturalist and outdoor sports enthusiast, Ian's adoration for and appreciation of nature's beauty is reflected in his attention to detail when creating outdoor spaces. 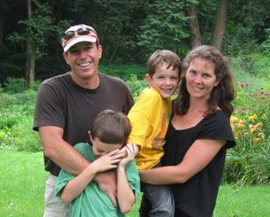 With over 20 years experience in the landscape design and construction field, he continually finds great fulfillment and satisfaction providing people a venue to "get out and enjoy nature", literally, in their own back yards. 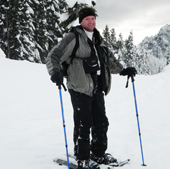 A lifelong artist with Fine Arts education, Ian enjoys painting, photography and writing in his free time.